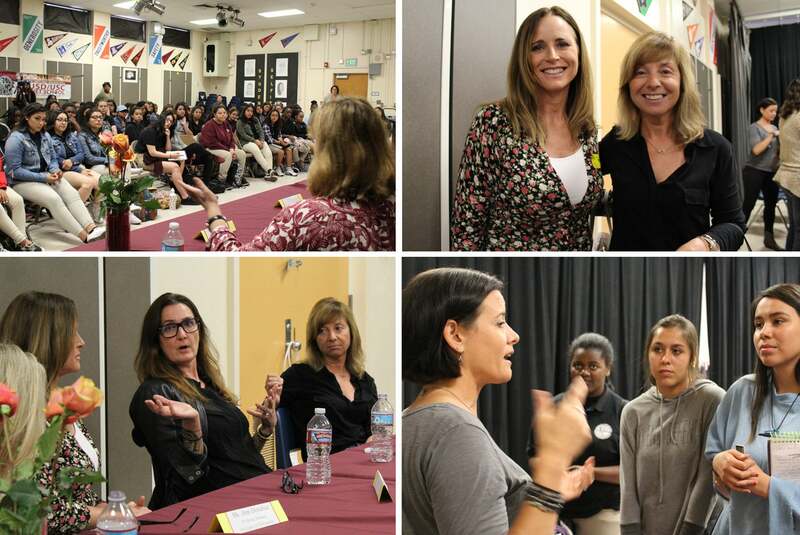 It was an inspiring experience when fellow HFPA colleague and journalist Elisabeth Sereda and I were invited to visit the LAUSD/USC Media Arts & Engineering Magnet High School to participate in a "Women in Film" panel. Only the female students were invited to the event held in the school’s auditorium and energy was high from the moment we arrived. 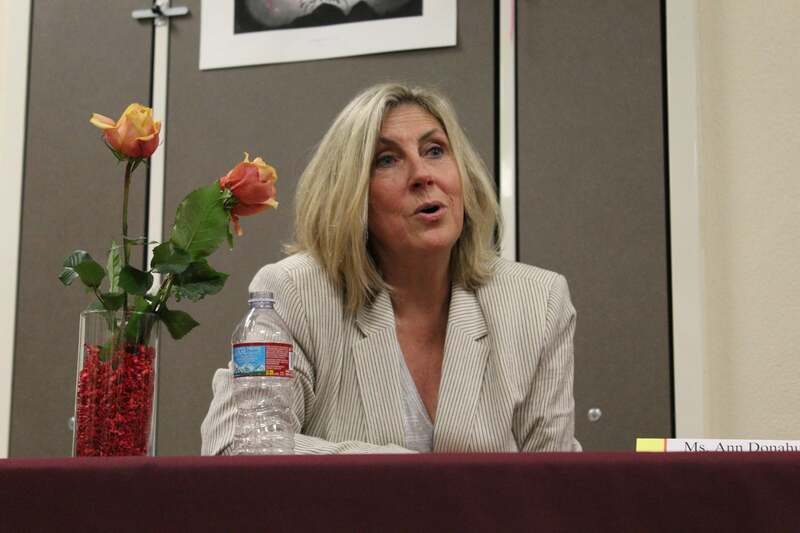 Panelist and writer/producer Ann Donohue, who co-created the CSI franchise, interrupted the opening remarks with a simple question as she observed male students in the back with cameras recording the panel. “Who wants to be a cinematographer or a director?” she asked. A few hands went up and she pointed to those girls and said, “Get up and take over that camera from the men!” The students applauded loudly and a little later when the microphone stopped working, Ann piped up again after Vice Principal Sue Becker said they were waiting for a male tech person to fix the sound equipment. “Ladies, one of you needs to come up here and try and fix it,” Ann commanded. A few girls nervously approached the equipment but the applause was deafening a few minutes later when they miraculously got the mike working again! Each of us introduced ourselves and told the audience what we do, offering advice we wish someone had given us when we were the same age. The students responded so enthusiastically, it was an emotional experience to see how thirsty they were for support and guidance and knowing we could give it to them by just sharing a little of our own story. Some were from low-income neighborhoods and grateful to hear success stories from women who also started with no money and no connections but a passion for the arts. Their questions were smart and our conversations were provocative as we discussed how to get ahead as a woman in a man’s world and told them not to give up. The whole event was recorded and edited into highlights with equipment provided to the school by a grant from the HFPA. We are excited to share the work of the students from LAUSD/USC Media Arts & Engineering Magnet School and congratulate their Cinematic Arts teacher, Matthew Waynee, who is also National Magnet Teacher of the Year. For the past two years, the HFPA have contributed $25,000 in grants to the school and we are proud to see how it’s making a difference in lives. One day, we hope to be interviewing many of these ladies who could be the next generation of women in film! Thanks also to the other rousing participants of the panel: Rerecording Mixer Anna Behlmer, Music Editor Robin Whittaker, Picture Editor Annie Guidice, Writer/Producer and Co-Creator of the CSI franchise Ann Donahue-Writer, TV editor Jane McCord and Camera Operator Kate Yerves. As an aspiring filmmaker and someone who’s constantly bubbling with questions about what the industry is really like, a panel like the Women in Film panel that was hosted at my school really left an impact on me. It’s always wonderful to hear other people’s stories and get their advice, and that’s exactly what the panel offered – advice from a group of women coming from different positions in the industry, able to offer their own insight on their journeys in the industry. Personally, I’m not really sure what specific part of the industry I’d like to work in, just that I want to tell stories. I like to try a bit of everything, so it was especially helpful to talk to women who worked in positions – from sound departments to editors, directors and so much more. The women even offered advice for us and were open to letting us contact them afterwards with questions we may have, openly handing out business cards and giving out emails where we could contact them. They answered every question we had openly and honestly, and I couldn’t have asked for a better line-up to learn from! The room was buzzing with energy and the feeling of empowerment afterwards; we were all excited to put what we had learned to the test. The ladies not only told us what we could do to get our names out there, but encouraged us to do it, at one point even instructing the girl’s in the crowd – one of which was me! – to get up and take the cameras from the boys filming the event, making us the cinematographers of the show. Just someone noticing that no girls had been filming and telling us to change that really put the room on its head and got us all excited. I knew that I was buzzing from that moment. The panel was truly a learning experience that many of the girls in the crowd found extremely valuable and loved, especially me! I was able to get down lots of great notes even from behind the camera. I’d love to have that experience again next school year. Thank you so much for the Women In Film Panel! It was such a great and enlightening experience, not just for me but for the rest of the girls who came as well. I’m thinking of pursuing a career in the film industry, so it really was helpful to listen to other women and hear what they did and how they got to where they are today. The film industry has always been a male-dominated environment, so it gives me hope through your stories that I can make it as well. This panel was also very helpful to girls who never considered a career in film. It was a very eye-opening experience for them to hear of a different career path. It was very helpful to hear that all of you succeeded. Thank you so much for your time. This past May there was a panel of powerful inspiring women that work in the film industry who spoke at our school. I took this as an opportunity to learn more about the film industry through a woman's perspective. I thought it was really interesting what they said and what they have accomplished. I have always had an interest in film, and this made me more interested in what I can do just because I am a female. I found it very interesting that these women have worked in the film industry for a while. The women said that there were not a lot of women working in the industry, and it was mostly men working on set. There was a woman who said that she remembered a time where she was working on set and that she was the only woman on set, which frankly is the sad reality in the film industry. All of the women in the panel had different jobs and different backgrounds. I found it really fascinating how all of the women did not initially want to go into film. One of them wanted to be photographer and ended up being a photo editor, which I thought was pretty cool. Overall this experience talking to the women in the film industry gives me a light of hope that all people can become whatever they want to be. They also said that film is very competitive, but in the end if you really are passionate about what you want, it will not matter what get it. This experience was very inspiring and I hope to do it again.